It’s part of the reason Tesla, flying-car companies and even humble Kickstarter projects let you order products before they’re completed. The other part of that reason? New companies fine-tuning speculative designs need cash to make their ideas a reality. That seems to be the case at Hoversurf, the California-based company that recently began taking reservations for its now FAA-approved Hoverbike. Your eyes don’t lie: you have seen this manned quadcopter (read: rideable decapitation machine) before. We caught wind of this new design on Uncrate, which notes the company is based in San Jose, as does Hoversurf’s website. But we wrote about them back in 2017 when they were apparently based in Russia and the vehicle was called the Scorpion-3. What gives? The first hoverbike model from Hoversurf. Photo via Hoversurf’s Facebook. The founder and CEO behind Hoversurf, tech entrepreneur Alex Atamanov, is Russian. But as the Washington Post wrote back when the Scorpion-3 trailer was released, “Atamanov set up his business — which has offices in Moscow and Los Angeles — about 10 years ago.” And as early as May 2015, the Hoversurf name was being used in conjunction with prototypes being tested on U.S. soil. Basically, what we’re seeing is the Russian counterpart to Elon Musk — a cliché comparison, to be sure, but a truthful one in this case. While Atamanov’s claim to fame vehicles lack the practicality of Tesla’s electric cars, the hoverbikes match them in notoriety. The Scorpion-3 has racked up millions of views on YouTube, including one called “Dubai police hoverbike!” which, contrary to first impressions, isn’t clickbait. While Musk is working on his tunnel system in L.A., Dubai police announced they would implement Atamanov’s Scorpion-3 back in 2017 and exhibited a new model this week at the city’s GITEX technology show. But back to the American-made and Federal Aviation Administration-approved Hoverbike. Officially christened the Hoverbike S3 2019, according to the website it can operate as both an unmanned drone and manned eVTOL vehicle (vertical take-off and landing). For the latter, Hoversurf received FAA approval for the vehicle in the Utralight Aircraft category, meaning you don’t need a pilot’s license. 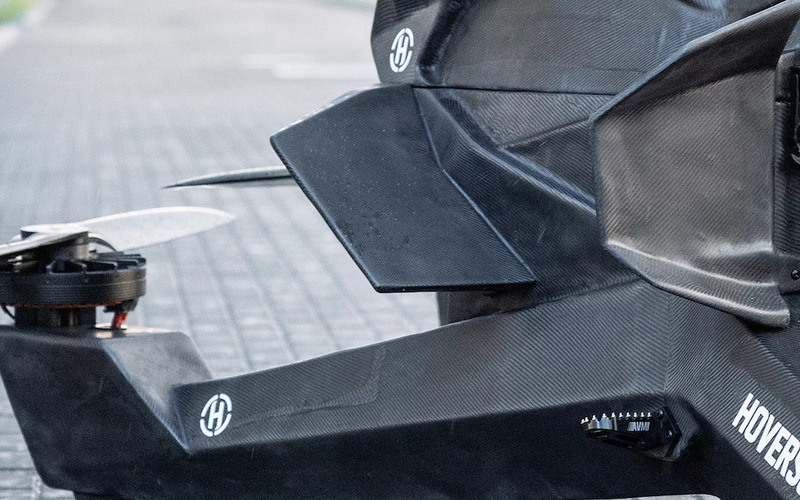 To achieve that, Hoversurf got the weight down to 253 pounds thanks to a new monocoque, carbon-fiber frame construction. 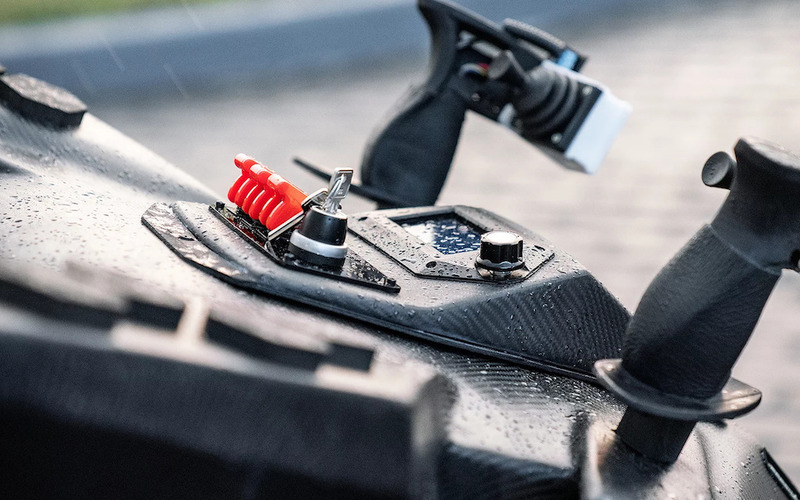 That weight cut also allowed for a larger battery, though the fly time is still a little underwhelming: up to 40 minutes in drone mode, but only 10-25 minutes in pilot mode “dependent on weight and weather conditions.” As for speed, we’re looking at around 40 MPH max. There’s a lot more to read (especially about their safety features) and a lot more to learn (especially about the two-joystick controls), but if you’re interested, Hoversurf is taking reservations with a two- to six-month turnaround. It’ll cost you $10,000 for a deposit on a $150K total price tag. But with no video proof of the touted capabilities beyond an underwhelming take-off clip posted three weeks ago, we’d recommend shooting them an email before hitting the “Pay Pal” button. This is one tech frontier where getting there second might be best.